Fun fact: the image you see on most covers of this movie, 乱, is actually the Mandarin word for chaos/disorder, which I think fits perfectly into the context of this movie, doesn’t it? Ran, directed by Akira Kurosawa, is a tale of greed, lust and power set in the old days of the samurai. The Great Lord Hidetora Ichimonji, after years of ruling a vast empire, has decided to abdicate and divide his land to his 3 sons, with the eldest, Taro, reigning as king, while the other sons are expected to follow under his orders. The second son, Jiro, complies but the youngest, Saburo, rejects and is banished by Hidetora. What follows next sets the stage for one of the best samurai movies ever made. Akira Kurosawa. One of the most influential directors of the 20th century as said by most film magazines. Lifetime Achievement Award receiver. Idolized by film-makers by the likes of Steven Spielberg, Francis Ford Coppola and Martin Scorsese. A film director that I have no experience of what-so-ever. Yes, Mr Kurosawa has been going under my radar for a while. Well, not really ‘under’, more like ‘tried to watched Seven Samurai three times and ended up sleeping half-way through’. That wasn’t the movie’s fault, by the way. It was late and I was laying on my bed. This is some-what a rite of passage for film lovers, isn’t it? You can’t call yourself a film geek without watching Kurosawa, the elitists would cry out. 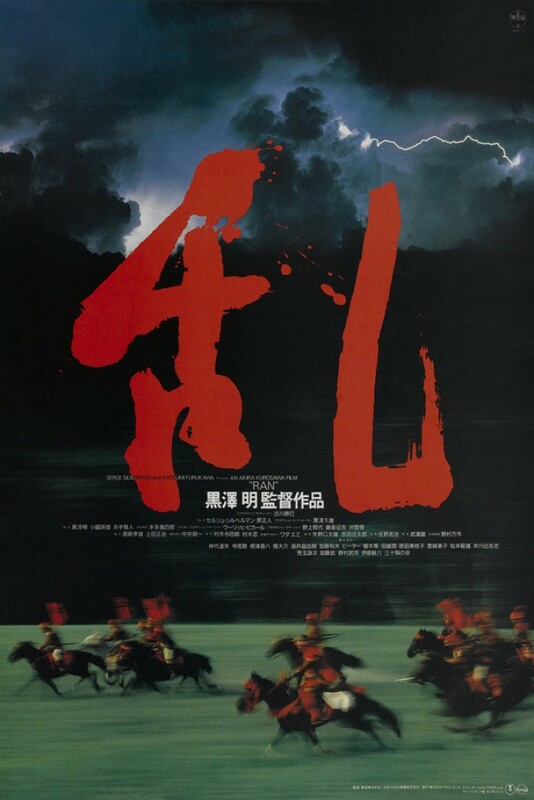 So, I did the only thing I could do to prevent such a thing from ever happening: I watched a Kurosawa film that wasn’t 4 hours long, and by the golly, it was quite a film. Of the things I can say about Ran, nothing comes to mind except for the word ‘epic’, with the phrase ‘holy s**t’ coming in a close second. Everything in this movie has Kurosawa’s touch. His attention to detail is amazing. Everything from the way the actors move to the gorgeous costumes to the several hundred extras to even the gusts of wind feel like Kurosawa put them there. Every shot looks like a painting come to life. It may sound like I’m exaggerating, but I’m dead serious. If you told me Kurosawa could bend nature to his will, I would believe it just on this movie alone. The acting in this movie is phenomenal. Everybody does their job spectacularly, both due to their own ability and Kurosawa’s direction. The way they move, the way they talk, and even the faces they make in all scenes are accounted for. All the important characters you either sympathize with or hate passionately. Even the jester, whom I hated at first, redeemed himself in the end. Oh, and color-coding the three brothers is ingenious. His use of color is so good I’m afraid that I may not be able to go back and watch his black and white films. All in all, Ran is indeed the masterpiece everyone says it is. If it wasn’t for the f**kin jester, the film would’ve gotten the full 5/5 stars. Nevertheless, this is an absolute must watch. The story is captivating, the characters intriguing, the cinematography stunning. I really should give Kurosawa another chance. This entry was posted in Film, Movie and tagged 1985, Akira Kurosawa, Ran, Review.